Rumors tell of another world detached from reality as we know it − a world of dreams. Inaccessible to most, but a new arrival is causing unrest among the natives. This is the first chapter of a story of that world and the space that separates it from ours. 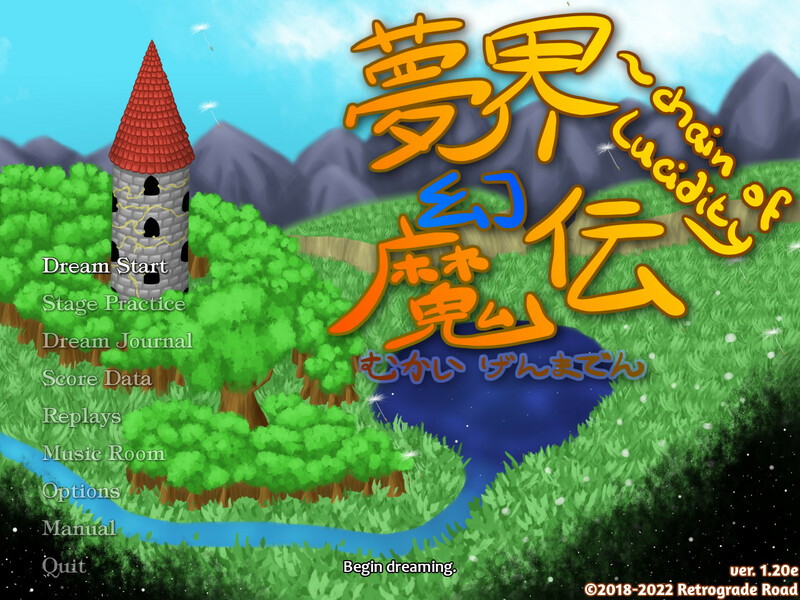 夢界幻魔伝 (Mukai Genmaden)～ chain of lucidity is a heavily Touhou/Len'en inspired shmup made by Popfan of Team Gaijin Alex. Was released about a month ago but figured I would make a thread here since nobody had done it yet. The game contains 5 stages, 4 difficulties, and an entirely original cast and setting. Players can choose between two separate shot types, a basic spread type and a basic homing type. The game features a Lucid mode mechanic, which is effectively a hyper type mechanic that allows you to gain extra shot power for a time if you activate it with the 'C' key while your Dream gauge is above 50%. If you activate the Dream gauge while it's at 100% however, you can obtain bombs from running out the full duration of Lucid mode without getting hit.